Le Golf National may not possess much classic architecture, but there's no doubt it will throw up some exciting moments. In August, we watched Brooks Koepka out-maneuver a charging Tiger Woods in a thrilling final round at the PGA Championship, played at the Robert Trent Jones-designed Bellerive CC outside St. Louis, MO. It was great entertainment. The finale was tremendously exciting and, besides Woods and Koepka, a number of big names finished inside the top ten. What more could anyone possibly want? For many (most?) golf fans the answer was ‘nothing’ - it was wholly satisfying. But, though similarly gripped by the action, the band of bothersome but unapologetic architecture nerds (labeled ‘snobs’) most certainly did want more. They wondered how special the event – every historically-significant and prestigious tournament, in fact - might have been had it been played on one of the game’s most cherished and valuable courses. Koepka couldn’t care less where it was played, of course, and one wonders if, in 30 years’ time, he’ll even remember where he won his majors. But if it were you, would you not rather win a major at Oakmont, Merion, or Winged Foot than a rather bland and unartistic course that fails to stir the soul or fire the imagination? 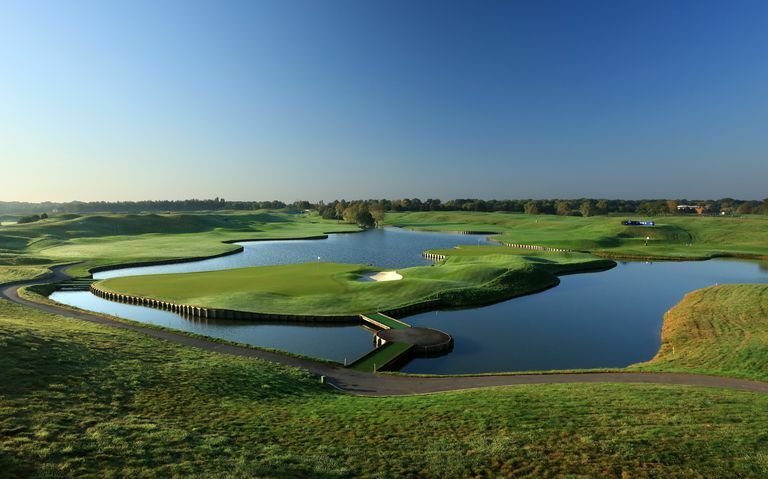 Which of course brings us to Le Golf National, outside Paris and venue for the 42nd edition of the Ryder Cup. It was designed and built on a flat, featureless site in Guyancourt, 20 miles southwest of the Eiffel Tower, and opened in 1990. Originally a collaboration between respected American designer Robert von Hagge and Frenchman Hubert Chesneau, who conceived the project, its actual development history isn’t entirely clear. Von Hagge, whom Chesneau hired as a consultant, left the project early after disagreements between the two emerged, though many believe his input was crucial and that the course’s design owes much more to his expertise and creativity. But though their combined contributions (and that of topographic engineer Pierre Thevenin) produced a course that has now staged 26 French Opens with an impressive list of winners including Tommy Fleetwood, Graeme McDowell, Colin Montgomerie, Retief Goosen, Martin Kaymer, and Sam Torrance, there’s no getting away from the fact Le Golf National was built in an industrial estate and possesses all the charm of…well…the Belfry, Celtic Manor, The K Club, and other European Ryder Cup venues that were chosen not for their antiquity and distinction, but their ability to outbid other faceless facilities desperate for the attention. 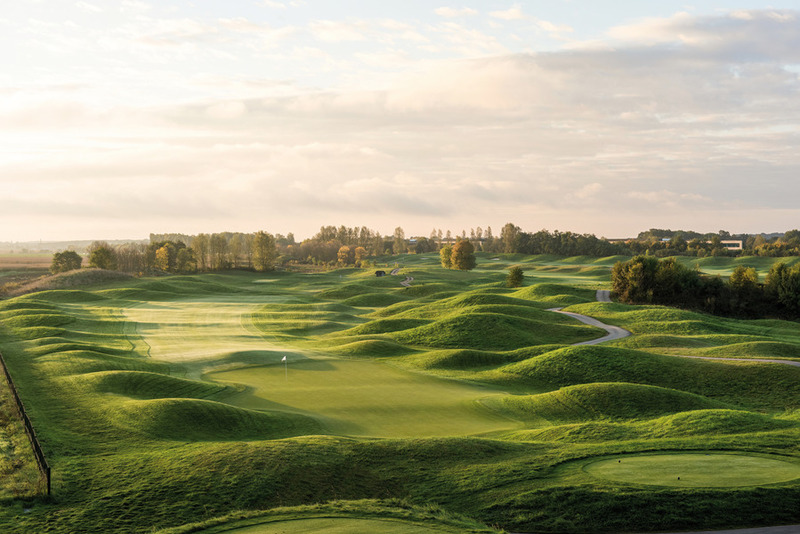 The man-made mounding at Le Golf National can accommodate 80,000 spectators a day. Could it be though that courses like Le Golf National are actually better for the Ryder Cup than established classics like Royal Lytham and St. Annes, Muirfield or Walton Heath? To be sure, it’s not important for Ryder Cup venues to be revered like those of the major championships. This event happens once every two years and is one of the few times large, non-golfing audiences are watching. Though an old, strategic test would keep the ‘snobs’ happy, it is an opportunity at least to show the world how exciting golf can be. And layouts with as much water as Le Golf National, especially on the closing holes (15th, 16th, and 18th), do provide a lot of excitement for TV viewers who want instant feedback. The person tuning into golf for the first time since the 2016 Ryder Cup at Haezeltine, likely won’t want to know why the ground’s subtle contours are so intriguing but will be greatly amused by balls splashing into lakes and players walking across cute little bridges to get to the green. And a field of 156 players isn’t challenging the course’s features, taking on the architect. Instead 24 are playing a matchplay contest in which all that matters is that you beat your opponent(s). It will go largely unnoticed by the vast majority of people watching, but a lot of what’s wrong with today’s professional game (minus the absurd prize money) will be on display at Le Golf National. The surfaces will be unnecessarily perfect after months and months of expensive preparation, and the course will be set up to encourage long, straight drives and high approaches that come to rest very shortly after landing – no need for imagination and inventive thinking here. That’s a shame perhaps, but I’ll happily put my architecture snobbery on hold for a week for a course that's bound to throw up a handful of cheap thrills and an exciting, memorable Ryder Cup, no matter how crass it might be. Does the choice of venue for the Ryder Cup matter? Actually, it got silly years ago. Every TV broadcast throws up dozens more instances of golf balls flying distances golf just can’t keep up with. The Western Washington women's team finished sixth at the PNLU Reach in San Diego, Tuesday shooting 75-over 651 for the two rounds.